When the Capitals qualified for the playoffs , fans let out a sigh of relief, but they may want to hold their breath. Washington has finally made it into the playoffs for the fifth consecutive season and they may, just may, be able to take their 5th division title as well. But for that to happen they will need a little help in net from Braden Holtby. The Caps have long been searching for a goaltender to hang their hat on since the departure of Olaf Kolzig. That search has resulted in a revolving door in Washington’s blue paint. This year is no different as the injury bug has bit the Caps goalies hard. Plan A: the two time All-Star Tomas Vokoun missed six starts due to groin injury in mid-March then made his first start in Boston when he re-tweaked this injury and is expected to miss the remainder of the playoffs. Plan B: the 24-year-old, Calder Cup winning Michal Neuvirth suffered a “lower-body injury” in the second-period of an important game against the Panthers on Saturday night. 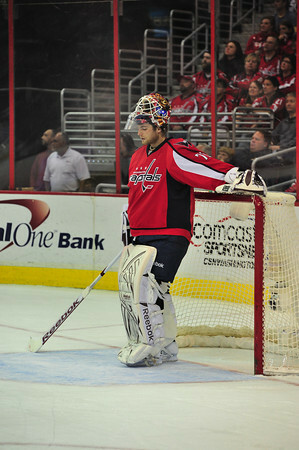 This brings us to plan C: Holtby. The Capitals aren’t going into unfamiliar territory. In their last four playoff runs they’ve never had an experienced goaltender in net with the exception of Jose Theodore, whose job was taken from him by Semyon Varlamov in both the ’09 and ’10 playoff runs. Aside from the 35-year-old Vokoun, who’s been nagged by groin injuries this season, none of the goalies in the Caps system have played a starting role with an NHL team. The closest thing is Neuvirth who still has only had 48 starts last season. Despite the storied history of shaky playoff goaltending, Holtby shouldn’t be the main focus for antsy Caps fans right now. While the severity of Neuvirth and Vokoun’s injuries aren’t known, the focus should shift from who’s in net to who’s putting pucks in the net. This year Washington has generated the fewest goals in a season since the ’03-’04 season, with offensive talent like Semin, Backstrom and Ovechkin all underperforming. It’s up to these guys to pull their weight, rather than resting the season and the playoffs on Holtby, who’s proven himself to be generally up to the standard the Caps need so far.